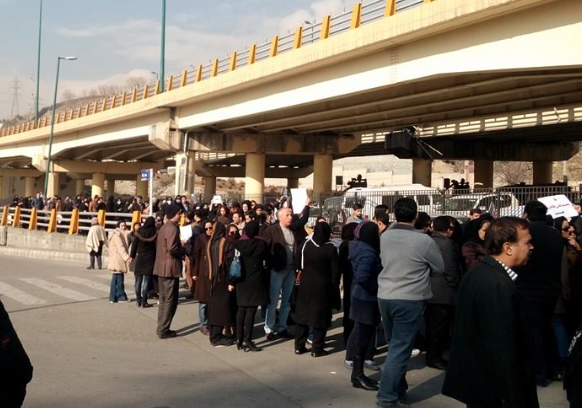 The families of protesters detained during the anti-government protests that began in Iran on December 28, 2017, have been threatened with arrest for holding a sit-in at Evin Prison in Tehran. “Since the first night he was arrested, we have been coming to sit in front of Evin Prison to ask about them but they don’t give us any answers,” Shokoufeh Yadollahi, the mother of detained student Kasra Nouri, told the Center for Human Rights in Iran (CHRI) on January 4, 2018. “They have had no contact with their families,” added Yadollahi. Tehran University student Kasra Nouri is a devotee of the Muslim Sufi order known as the Gonabadi Dervishes, whose followers are subjected to state discrimination and imprisonment for believing in an alternative interpretation of Islam. Nouri and four other dervishes—Mohammad Sharifi Moghaddam, Faezeh Abdipour, Mohammad Reza Darvish and Zafarali Moghimi—were arrested while they were visiting fellow mystic, Hamidreza Moradi, at Day General Hospital in Tehran on December 30, 2017. Moghimi was released the same evening but the others remain detained without charge. The detainees are being held in Evin Prison’s Ward 209, which is controlled by the Intelligence Ministry. According to state-run news agencies, at least 22 people have been killed and more than a thousand arrested between December 28, 2017, when the protests began in the city of Mashhad, and January 3, 2018. Officials have avoided blaming security forces for the deaths, but anti-riot police and the semi-official Basij volunteer militia force, which operates under the control of the Revolutionary Guards, have been instructed to quell the protests. The University Trade Unions’ Council of Iran (UTUCI) issued a statement on January 1 condemning the arrests of 17 students. CHRI has learned that in Evin, more than 200 inmates in one ward were transferred to other wards to make room for the new detainees. The authorities of Rajaee Shahr Prison, located west of the capital, have meanwhile allocated a hall with the capacity of more than 150 prisoners to make room for the new detainees, according to a source who requested anonymity for security reasons. “Some of the suspects expressed remorse and said they had been influenced by propaganda on social media and illegal calls to protest,” claimed the report, which represented the state’s interpretation of the protests. A day earlier, the prosecutor of Tehran Province, Gholam-Hossein Esmaeili, announced on January 3 that preliminary investigations regarding the detainees had gotten underway. Six prominent Iranian lawyers have called for the prosecution of Iranian officials who have incited violence against the protesters. “We demand the immediate termination and independent prosecution of officials whose statements have had a critical impact on inciting emotions and violence during the people’s lawful and peaceful demonstrations,” said the lawyers in a joint statement sent to CHRI on January 3, 2017.